Technology is so widespread these days that people actually take vacations from Tech. Where they leave their laptops and tablets and even their smartphone at home and embark on a journey of self fulfillment and discovery. I’m not sure that’s for everyone. Information is useful. Especially when you are going to totally new place you know nothing about. This is the time to use technology and apps to improve your experience. Findery is an app by Caterina Fake, the co-founder of Flickr. It takes a novel approach on discovering new places and the presenting the best they have to offer with the help of your iPhone (It’s also available on the web). It looks like a Maps app, but its purpose is not to direct you to a place but help you explore the best of where you are right now. Findery is a community driven app. Although it launched just last month, it’s technically not new at all. Findery first came to light as Pinwheel and has spent 2 years in closed beta gathering all sorts of cool information. 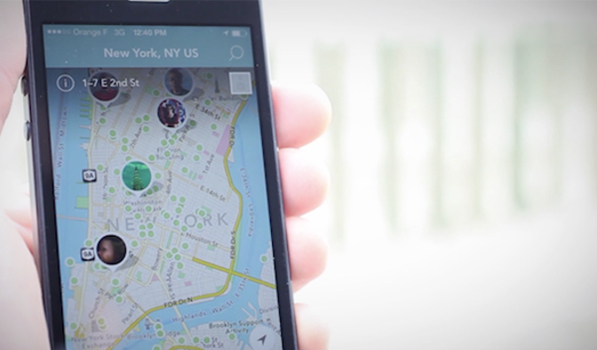 Findery allows users to tag a location with text, images, audio or video. You can geo-tag anything you like, a story of a part of your life you spent there, its historical importance or what the future entails for the place. You can choose to keep your notes private but you should make the public, so when a traveller from a land far away shows up at a square populated with restaurants and food carts, he’ll know just where to go to find the best kebabs. Findery’s UI is minimal with free hand style icons. From the Map section, you can browse all the notes tagged near you or search for a specific place. The Activity menu will show you what all your friends are up to, the Create menu brings up a notes editor and the Discover menu shows you the best Notemaps from Findery users from across the globe. Notemaps are like treasure maps, only here, the hidden treasures are experiences you normally wouldn’t be able to have. You know when you go to a totally new place and wish you had a local show you around? With Findery you have hundreds of locals guiding you through the city, exposing you to experiences alien to travel guides. Findery is available for Free on the App Store.